Scouring the internet, no one ever tells you how in the WORLD to go about finding places to take photos at. It's all 'consider your surroundings' or 'find somewhere neat', but honestly, if you live in a suburb and there aren't abandoned houses or something, how do you find a place to take photos? If you are ready to venture off the porch/lawn of your place, then here's my tips on how to find places to go. I spend an absurd amount of time on Google Maps because I'm a road geek and find things like wrong way concurrencies amazing. But, Google Maps is also super helpful. 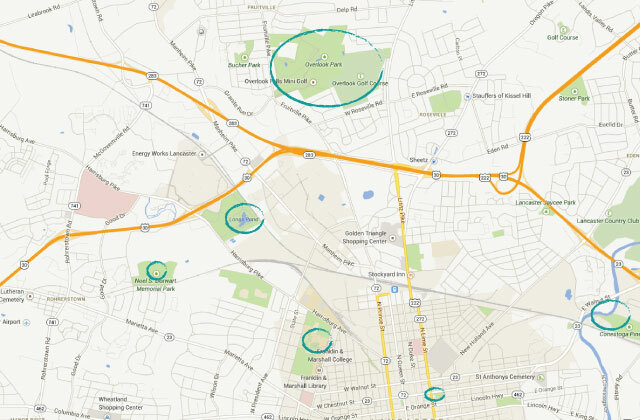 Look for the big green blocks of areas or the light brown blocks (usually colleges). Parks and colleges are wonderful for taking photos, and Google Maps is a great way to find some places to go. This sounds obvious, but it isn't. I mean, what in the world are you supposed to Google? 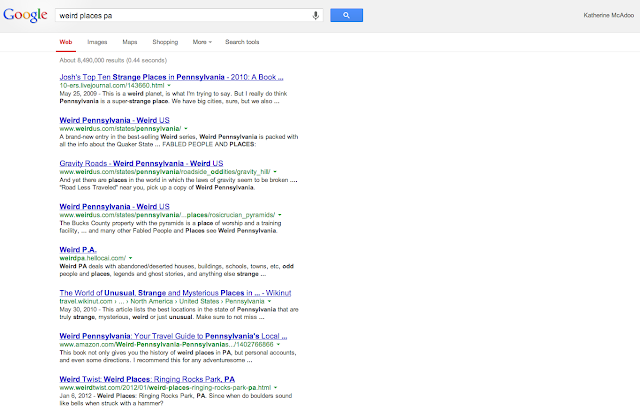 I've typed in 'weird stuff in PA', 'abandoned PA', and 'park trails PA' a lot. Also 'small towns PA' works to get me places like Lititz. You'll find a lot of my photos are just in new places to me, and often little cities. Going out for dinner with friends in a new part of town? Arrive a bit early, find a colorful building or two, and voila. Bars and restaurants can occasionally make nice settings as well. Eating early isn't a bad thing because you get better light. When I visit a restaurant or other local place, I take note of any areas I see that might work. The bridge over the train tracks behind Iron Hill Brewery was one of these places, and works well since I can stop there after a beer at Iron Hill! Try again! Some of my favorite spots weren't great at first for some reason or the other - wrong lighting, wrong location within the spot (often at parks, I end up setting up somewhere, realizing it's not great, but getting nervous or I am rushed, and do it anyway). Don't rule something out until you try it twice. The first photo here isn't taken far from the second, but my choice of location due to nerves in the first one wasn't as pretty so they didn't turn out as well. 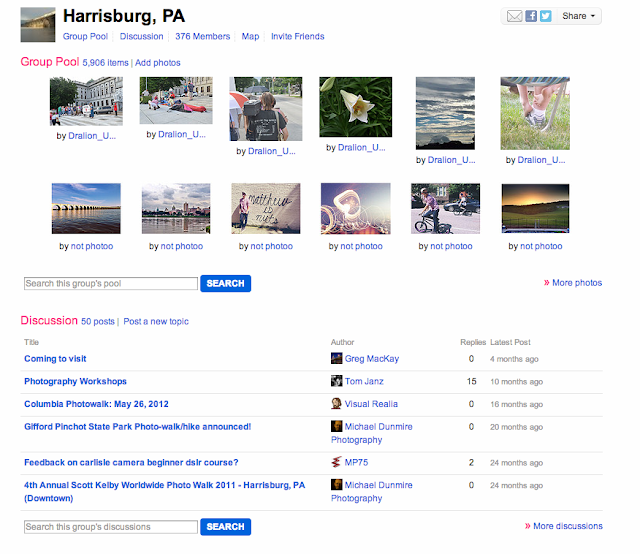 Join groups for your area on Flickr. Search using geotags. 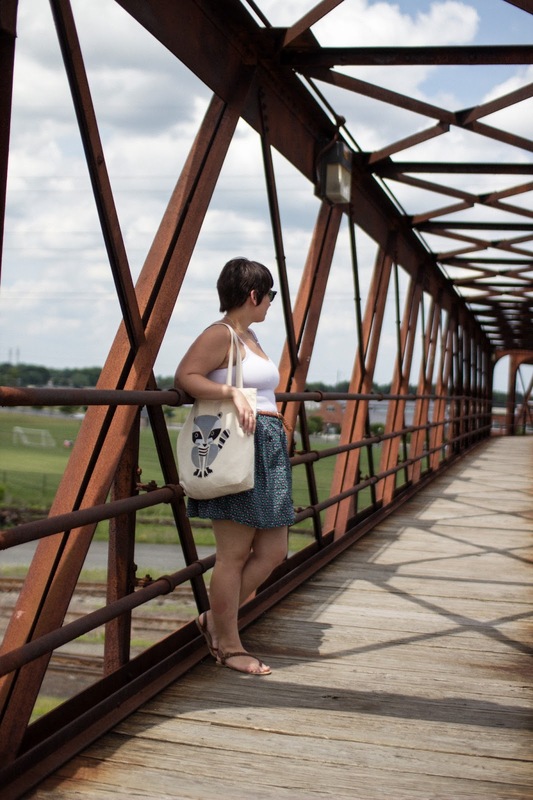 I cannot tell you how much this helped me when I moved to Harrisburg. Having a friend to set up with you, even if they aren't taking your photos, helps a lot. I probably would have been petrified at this location because it was a VERY steep hill, but I had friends to help me out. I'm going to say it again and again until you all wanna kill me. Be brave, take deep breaths, and just do it. It's like riding a bike. Or swimming. It's weird and scary at first, then it becomes totally normal. I look really awkward and stern in this photo because I'm super nervous about someone across the street. For no reason. Thanks for the tips, finding places to shoot is always awkward for me. that picture of you and the drink is straight up adorable! this is super helpful - I live in the middle of a busy metropolitan area, so getting anything that isn't "crowded sidewalk" or "gross backyard" is tough. I have to branch out! Thanks for the good idea! I mostly take pictures in my back or front yards but I know I need to branch out! I love this! Really wonder tips! I never would've thought to use Google Maps and Flickr! And you're right, I just need to breathe! Ha- what a brilliant post. Sadly some of these don't work as well fore because no one lives in the area according to the Internet ( it is sad how a small population affects Internet related things). But checking Flickr maps is brilliant t and I totally keep lists and notes too! Fabulous advice. This is INCREDIBLY helpful! I find myself just taking pictures in front of the same spot every single time, which is probably why I hate taking pictures so much, haha. Who knew all it needed was a little Google Maps and sense of adventure! That's so awesome that you use google maps for this. I sometimes go for drives looking, but usually I'm strapped for time and just take them somewhere convenient. I love all the spots you take yours!! Love these tips - especially using Google Maps! these tips are awesome lady! i never thought to use google maps! flickr is a great tip! never thought to do that!